Poverty is easy to see, but less easy to define – or to measure across a city, a province or a country. Many measures of poverty use money. If a person lives on less than a certain threshold income they are considered to be living in poverty. 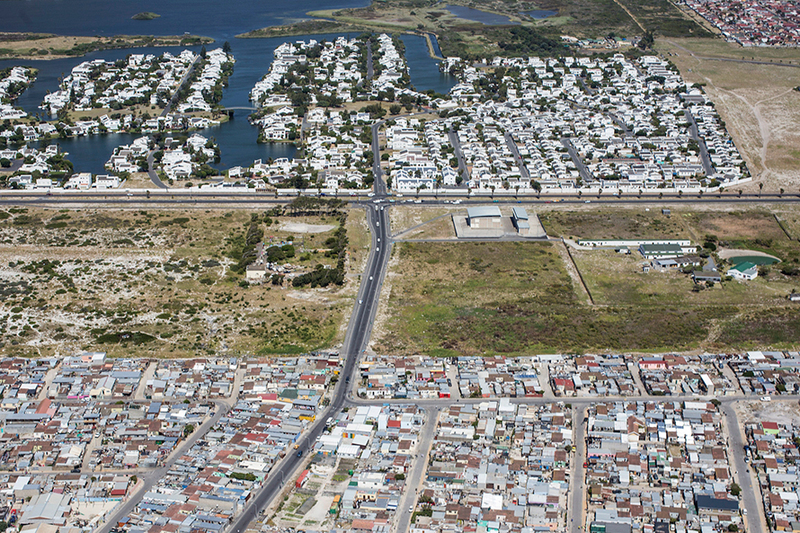 Income is used for the three national poverty lines developed in South Africa. These are the food poverty line (set at R531 per person per month in April 2017), the lower-bound poverty line (R758) and the upper-bound poverty line (R1,138). Another picture can be painted when we look beyond income to the other ways people experience poverty. How does poverty reveal itself in people’s health, their level of education, the dwelling they live in, how they cook their food, the water they drink? Poverty examined according to different types of deprivation is known as multidimensional poverty. 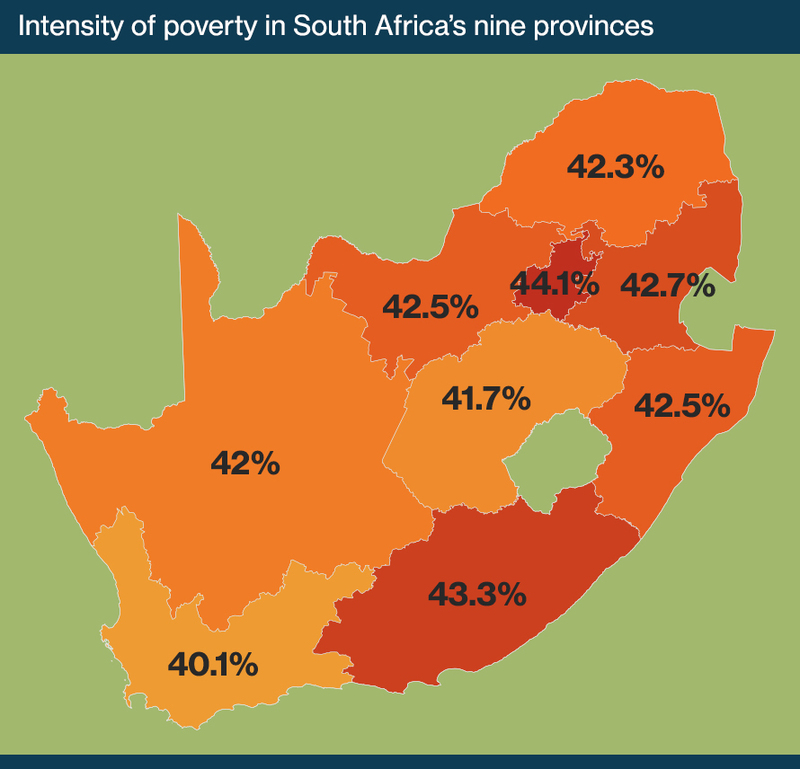 For its 2016 Community Survey, on which the feature Mapping poverty in South Africa was based, Statistics South Africa used the South African Multidimensional Poverty Index. The index calculates the poverty of households according to four aspects of life: health, education, living standards and economic activity. These four are known as the dimensions of poverty. Each dimension is assessed according to different indicators. The health dimension has only one indicator: child mortality, or whether a child under the age of five living in the household has died in the past year. Education has two indicators. One is years of schooling, or whether no person in the household aged 15 or older has completed five years of schooling. The other, school attendance, looks at whether any school-age child seven to 15 years old does not attend school. Living standards has seven indicators, to do with fuel, water, sanitation, type of dwelling and ownership of assets. What fuel does the household use for lighting, heating and cooking? Is there piped water in the dwelling? Does the household have a flushing toilet? What kind of dwelling does the household live in? What does the household own? Economic activity is measured by joblessness: whether all the adults, people aged 15 to 64, are out of work. Each household is scored according to these indicators. If the score is 33.3% or more, the household is living in poverty – they are “multidimensionally poor”. The score also measures the intensity of poverty. In the 2016 Community Survey, the average intensity of the poverty experienced by multidimensionally poor people in the nine provinces ranged from 40.1% in the Western Cape to 44.1% in Gauteng. The multidimensional poverty index is not intended to replace the other important measures of poverty. The food poverty line, for example, is the rand value below which people are unable to buy enough food to give them the minimum daily energy requirement for adequate health. The multidimensional index, Statistics South Africa says, should rather be seen as “a complementary measure to these money-metric measures”.